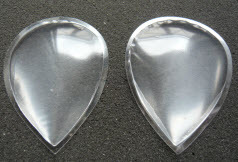 Taiwan & China Manufacturers and Suppliers.Suppliers,Buying Leads,Selling Leads,Trade Show,Online Trade ShowsHow to SellHow to BuyPost Trade Leads,Welcome To The Premier Industrial Resource For Gel Insoles. 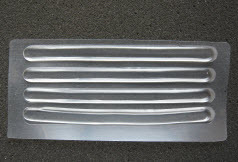 SuppliersProductsSelling LeadsBuying LeadsCompanySPEC,Manufacturers Category, Shoes & Shoe Materials, Shoes Material & Accessories, Gel Insole,Related Categories,Shoes Manufacturer,Related Items,Shoes Accessory,Shoes Insoles,Shoes Ornament,Shoes Material,Insoles,Orthopedic Insoles,Shoes Lace,Shoes Buckle,Shoes Tie,Foot Insoles,Orthotic Insoles,Related Products,Gel Orthotics Insoles,TPR Gel Orthotics InsolesFor,TPR Gel Anti Pressure Heel,Tender Anti Pressure Fore Foot,Footcare Cold Insole,Join This Directory, the online source of Taiwan and China manufacturers which help global buyers find and do business with 20,000 companies.directory, inquire, Taiwan Shows & Taipei Trade Show,New Gel Insoles Products,Gel Soft Pads, For Invisible,PU Gel Pad Insoles,Footcare Cold Insole,Half Gel Insoles For Pressure,Insoles For Sport And Casual,Gel-Soft Pads For Toe Cover,Gel Orthotics Insoles,Tender Anti Pressure Fore Foot,TPR Gel Anti Pressure Heel,TPR Gel Cover Insoles,Gel Soft Pads For Lace Toe,PU Gel Mid. 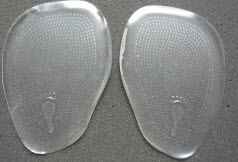 Layer Insoles. 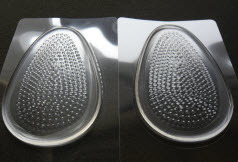 Pressure Reduced Insoles For,Insole Stickers For High Heels,PU Gel Insoles,TPR Gel Orthotics InsolesFor,TPR Gel Orthotics Insoles For,Gel Protectors For Arch,TPR Gel Orthotics Insoles For,Orthotics Insoles For High Heels,Related Searche, Gel Insoles,Gel Insoles, From Taiwan & China Reliable Gel Insoles Manufacturers & Suppliers Select to, Select All | Clear All – Gel Insoles, Y-T Industrial Co., Ltd. : Gel Insole ( Origin : Taiwan & Mainland China Manufacturers & Suppliers ) Taiwan manufacturer and supplier of Gels Insoles, Y-T Industrial Co., Ltd. since located in 1984. Excellent Quality, Best Service, Profession, and Sincerity are the positive feedbacks earned from our clients. We will be in a sound position to provide clients with the highest performance on our Gels Insole products and enable us to share the fruits of success with you. We welcome your suggestions and ideas on how we can make our company a better supplier and an improved partner to your business. 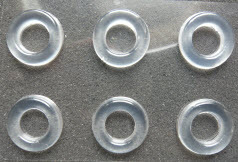 100% Quality check will be performed to make sure the goods are of high quality standard when delivered to customer end. Y-T Industrial is your best choice. Also see products: Gel Insoles or its product categories, * Company Link * Company Profile * Product Map * All Products * Hot Products Gel Insoles Manufacturer & Gel Insoles Supplier. Taiwan Ho Yi Paper Co., Ltd. : Gel Insoles ( Origin : Taiwan & Mainland China Manufacturer & Supplier ) Taiwan Ho Yi Paper Co., Ltd. is a 100％ foreign owned company invested by our company of Taiwan. By being the most recent entry and the most capital intensive company in the innersole paper board industry, our company offers the latest technologies in making Gel Insoles, innersole paper boards for shoe production and liners for briefcases and suitcases. We are so reliable that you can have a good relationship with us. Besides, we not only provide high quality but offer a execellent service for our customers. Don’t hesitate, just become our business partner. We are pleasant to hearing your any reply. It’s will be your wisdom to choose Ho Yi Paper with you on business. 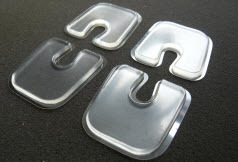 Handy-Age Industrial Co., Ltd. : Gel Insoles ( Origin : Taiwan Manufacturer & Supplier ) Handy-Age Industrial Co., Ltd. is a manufacturer of Gel Insole with professional technique and capability on designing and manufacturing Gels Insoles products. We are full of flexibility on manufacturing and possesses capability of integration to handle with multiple transactions and small quantity orders of different application. We always insist and emphasis on the principles of service, quality, innovation and business continuity and keep optimum status to provide the best service to our clients. Any inquiry or phone call is welcomed all the time. We will reply to you as soon as possible. Looking forward to have a long term business relationship with any of our customers. Just visit on our showeroom for more information. Anti Rubbing Shoe Rim TPR Gel Insoles Sticker 1. Are you having trouble of wearing your beautiful high heels? Is wearing High Heels a nightmare to you? In fact, wearing high heels can be comfortable. 2. “It’s my most beautiful shoes; but, it’s not the most comfortable shoes.” Does this occur to you every time when facing hard time in choosing shoes? 3. Here comes high heels saver. 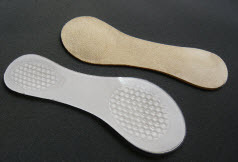 Our orthotics Insoles are made of TPR Gel which is very soft and high elastic. TPR Insoles can help reduce the pressure of thenar and make your feet healthy without pressure while walking. 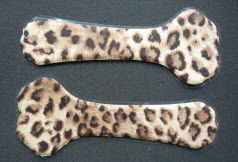 Therefore, give your high heels TPR Gel Insoles to save your feet AND your beautiful high heels as well. Just stick the Gel Insoles wherever will make you uncomfortable while walking. 4. Features: 2. Tender Anti Pressure Fore Foot Gel Insoles Sticker 1. Are you having trouble of wearing your beautiful high heels? Is wearing high heels a nightmare to you? In fact, wearing high heels can be comfortable. 2. “It’s my most beautiful shoes; but, it’s not the most comfortable shoes.” Does this occur to you every time when facing hard time in choosing shoes? 3. Here comes high heels saver. 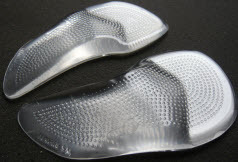 Our orthotics Insoles are made of TPR Gel which is very soft and high elastic. TPR Insoles can help reduce the pressure of thenar and make your feet healthy without pressure while walking. 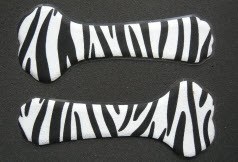 Therefore, give your high heels TPR Gel Insoles to save your feet and your beautiful high heels as well. Just stick the Gel Insoles wherever will make you uncomfortable while walking. 4. Features: 3. 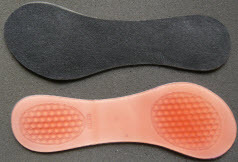 Footcare Cold Insole.1. Enjoy this break though only with liquid Gel filled inner soles. 2. Helps stimulate blood circulation.4. 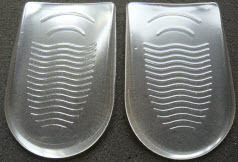 TPR Gel Orthotics Insoles For High Heels 1. Is wearing high heels a nightmare to you? In fact, wearing high heels can be comfortable. 2. “It’s my most beautiful shoes; but, it’s not the most comfortable shoes.” 3. Does this occur to you every time when facing hard time in choosing shoes? 4. Here comes high heels saver. 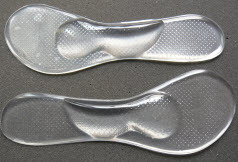 Our orthotics Insoles are made of TPR Gel which is very soft and high elastic. TPR Insoles can help reduce the pressure of thenar and make your feet healthy without pressure while walking. 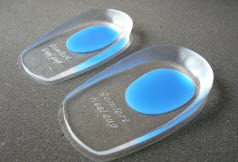 Therefore, give your high heels TPR Gel Insoles to save your feet and your beautiful high heels as well. 5. 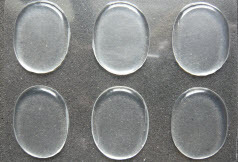 Features: (1) There is a 1mm Gel between dual sponges, which effect is better than normal. (2) The grade of Mesh Fabric as shaping clothes is ventilation,…5. TPR Gel Orthotics InsolesFor High Heels TPR Gel feature: TPR Gel, which Tsung Hua uses, has even better stretch ability and softness, so that TPR can resist tremendous twist and friction while walking. 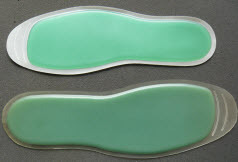 Gel insole / Gel foot health care product 1. 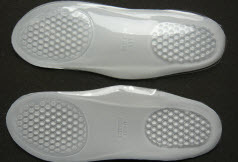 Though Gel insole, wearing high heels can be comfortable. 2. “It’s my most beautiful shoes; BUT, it’s not the most comfortable shoes.” Does this occur to you every time when facing hard time in choosing shoes? 3. Here comes High Heels Saver. 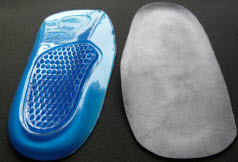 Our orthotics Insoles are made of TPR Gel which is very soft and high elastic. TPR Insoles can help reduce the pressure of thenar and make your feet healthy without pressure while walking. 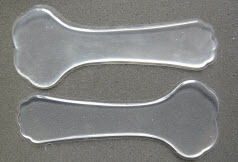 Therefore, give your high heels TPR Gel Insoles to save…6. Half Gel Insoles For Pressure Reduction Feature: TPR Gel, which Tsung Hua uses, has even better stretch ability and softness, so that TPR can resist tremendous twist and friction while walking. 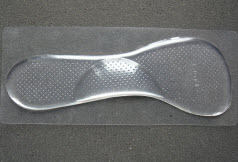 -Gel insole / Gel foot health care product Shack-absorbed, pressure-reduced, supporting-comfort: 1. Shack-absorbed: according to the test of Gel, the face of Gel will disperse the pressure to absorb shocks. 2. Pressure-reduced: the heels will sustain two thirds of body weight, the Gel can reduces the spinal pressure and prevent waists while walking. 3. Stop slipping: the Gel is liquid that will be changed follow external force, and the adhesion is better, so it will prevent slipping. 4. Half Gel Insoles for pressure reduction, orthotics Insoles,…7. 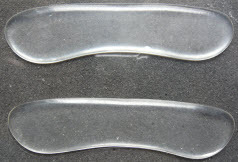 Gel Orthotics Insoles 1. Very honored to introduce Tsung Hau Technology Co. from Taiwan to you. We are a manufacture of healthy products. We have the exclusive know-how of combining textile with TPR-Gel. Only we can create such products. 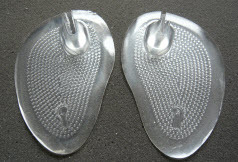 You can put Gel Insoles in your shoes to absorb the pressure. Allow feet to rest in a natural and comfortable position. 2. 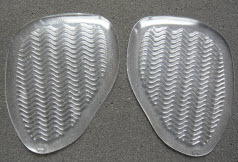 Features: Gel insole (1) Reduce the pressure and absorb the shake of Heel Pads. (2) Disperse the pressure of foot. (3) Reduce the pressure of heel and make your feet healthy. (4) Prevent the injury of heel. (5) No pressure while walking. (6) Prevent the thenar angles inside by design of wave Gel. 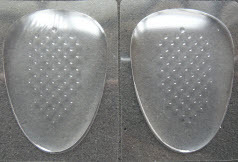 a. JG-267 Half Gel Insoles for pressure Reduction (for male). b. JG-268 Half Gel…8. TPR Gel Anti Pressure Heel Insoles Sticker 1. Are you having trouble of wearing beautiful high heels? Is wearing high heels a nightmare to you? In fact, wearing high heels can be comfortable. 2. “It’s my most beautiful shoes; but, it’s not the most comfortable shoes.” Does this occur to you every time when facing hard time in choosing shoes? 3. Here comes High Heels Saver. 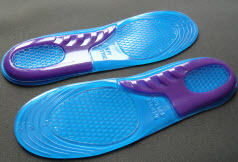 Our orthotics Insoles are made of TPR Gel which is very soft and high elastic. TPR Insoles can help reduce the pressure of thenar and make your feet healthy without pressure while walking. 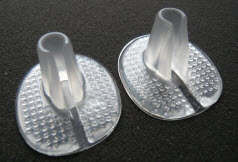 Therefore, give your high heels TPR Gel Insoles to save your feet and your beautiful high heels as well. Just stick the Gel Insoles wherever will make you uncomfortable while walkingMedical, Health Supports, Orthopedic, Rehabilitation Braces, Athletic, Medical Protectors, Silicone, Gel Foot Care Products, Post-Op Health care Products, Splint Material Products, Neoprene, Elastic Supports, Living Aid / PU Foamed Mat Products, Personal Care, Fitness Products, Heel Adjustable Cushion, Heel Comfort Pad(Heel )(Grip), Silicone Heel Cushion, Gel Heel Cup Cushions Pads, (Thick)3/4 Length Metatarsal Pad(Heel, Front With Blue Color Dot), (Thick)3/4 Length Metatarsal Pad, Front Foot Pads, Front Foot Pads, Walk Straight Heel Cushion(Blue Color), Gel Heel Cup Cushions, Gel Toe Crest Cushion, Silicone Feet Gel Cushion, Toe Separators, Toe Gel Cap (Polymer Gel Caps), Digital Gel Tubes, Toe Cap, Gel Tube, Gel Digital Strip Tube, Strip Dot Pads, Fabric Feet Gel Cushion, Bunion Shield, Last Toe Bunion Gel Shield, Silicone Gel Sock, Foot Cushion(Based on Transparent Color), Foot Cushion(Based on Blue Color Dot) , Silicone Heel Pad, Silicone Heel Pad (Based on Blue Color Dot), Release the pressure from long time standing, jogging, or long-distance walking, Friction and abrasion prevention from corns and other interdigital lesions, Realign overlapping toes are also halped, Most recommended after forefoot surgical procedures, Designed to prevent friction from corns and interdigital lesions, Ideal products after forefoot surgery.